Research & Development | Delta Electronics (Thailand) PCL. The main focus with high priority in 2017 was the business development and the corresponding products for the electro-mobility. For all the designed products, continued improvement and increasing the efficiency, were the Delta focused targets. 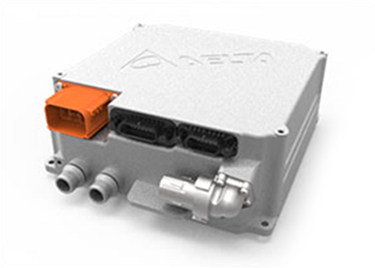 Delta has increased the efficiency of its power products by broadening the application of its key technologies. Thus we continue our efforts to reach the Delta set targets in green environment for the energy saving power devices. Delta has invested in its worldwide R&D centers (10 in total), located in Asia and Europe, to maintain their competitiveness and leadership in energy saving and efficiency of the products and to understand and realize the customer demand. Delta appreciates further on the cooperation with the renowned universities. This collaboration is a big benefit with innovative and green ideas combined together with the Delta R&D expertise. This is a trustable way to establish a long-term and continuous relationship with young and experienced people, to take care of high-tec, new and sustainable products. Delta beliefs in its close cooperations with key customers. Our customers are both worldwide market leaders as well as innovators for new technologies, products. Delta welcomes the new customers in new industries, which give the opportunity to drive new processes and implement new technologies for the upcoming market challenges. Through Delta’s continued leadership in the electronic world, realized through its green philosophy, which has been pursued over decades, the company strengthens and follows its wish to reduce world pollution. Delta’s worldwide R&D team has accumulated decades of experience and knowledge in developing highly sophisticated customized power supplies for well-known companies in the IT domain, networking and telecommunications industry. We have applied our knowledge into developing new products beyond traditional power supplies which enabled us to become a system solution provider. In 2017 we were able to get the award of the Power-Shelf for the new open19 community. The Shelf hosts 6 AC/DC PSUs with 3200W and 12V output, which output power is current limited and splitted into 50 separate outputs. 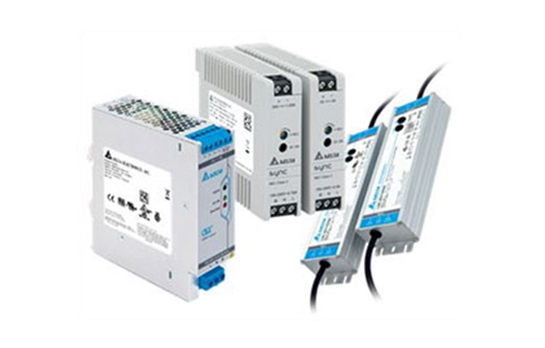 Each of the outputs is capable to act like a 400W PSU with all features known from a AC/DC supply, like PMBus monitoring, turn on/off, hot-plug, current limit, short circuit protection, etc.. 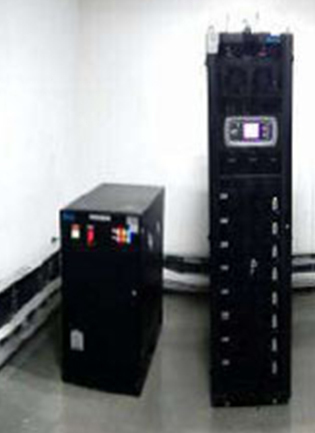 This system includes 50 PSUs with standard 1U height which are installed in a centralized Rack. The system has the advantages of a modular, distributed power architecture on the one hand and on the other hand the benefits of a high power centralized architecture. In parallel to this complex design we are developing products with > 98% peak efficiency delivering 3000W and 6000W output power having at the same time a power density of > 60 W/in³. These 54V PSUs still use traditional Si-Mosfet technology and the high efficiency is realized by special control & modulation techniques. These “base” technology platforms have a high degree of standardization and it can be used very flexibly for our new “rapid customized Standard” PSUs, which program was also successfully. In addition to only power supply design, R&D’s core achievement was the continuous extension of our product offering to additional products used in Datacenters, like complete sever shelfs with distribution panel and power distribution units. Our R&D team was able to meet and even surpass our customers’ expectations moving forward to solutions offering. In 2017, Delta R&D has brought additional DC/DC converters and On-Board Charger products to mass production. Delta R&D also improved existing products, like Battery Junction Boxes and Onboard-Chargers, to apply them to additional car platforms. To strengthen the customer relationship and to prepare future awards in 2018, Delta R&D started to develop two DCDC prototypes (2.5kW and 3.7kW) and a measurement unit derived from the Battery Junction Box project, which will become a standard on many different car platforms. Delta is aiming to extend the existing customer base by leveraging and extending the existing technology and adapting it to the customer needs. By integrating different types of applications into one package or (sub-) system, Delta becomes more and more a provider of system solutions. In 2017, several new projects have been awarded to Delta. This includes the successor project of an existing On-Board-Charger (OBC), which Delta R&D has developed in different variants/ power levels (3.7kW, 9.6kW, 11kW) has been awarded. The largest model is operational at single phase as well as 3-phase, applicable in US, Europe, and Asia. The design is based on the Delta modular technology approach. 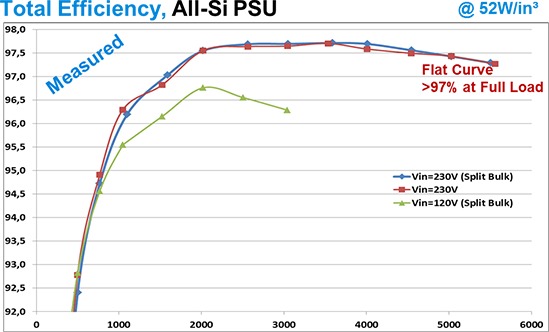 In addition, Delta develops an 800V variant of the 3.7kW OBC for another customer. Furthermore, a unit to manage the DC charging, supporting all communication standards for the US, Europe, and Asia (CHAdeMO and GB/T) has been awarded to Delta. This DC Charging Box will be developed in different variants to support various voltage and current levels. Delta continues to extend its modular technology platform from 3 x 3.7 kW modules to new 3 x 7.4 kW modules allowing 22 kW for fast charging of Battery Electrical Vehicles. These modules incorporate the latest innovations in terms of packaging and component selection to satisfy increased power density requirements based on proven technology. Several major innovations have been performed by Delta’s R&D team in 2017 to provide our customers with the best-in-class cost-performance ratio for industrial and medical applications, such as factory automation, machinery and robotics, battery charging technology, ultrasound application, artificial respiration and dialysis. The use of advanced power and control technology has led to products with the best-in-class parameter stability, efficiency, operation flexibility and reliability. Delta R&D team designed a 1kW wireless charger and will transfer this important product to mass production in 2018. Customer demonstration units are operating successfully and market feedback is extreme positive to this outstanding product. In addition to the 1kW wireless charger solution Delta R&D could win a custom design project for 30 kW and 20kW wireless charging module for fork-lift charging. The Delta R&D Team has also designed a Sinewave Converter. This Power Supply is able to varying continuously a DC and AC Current. 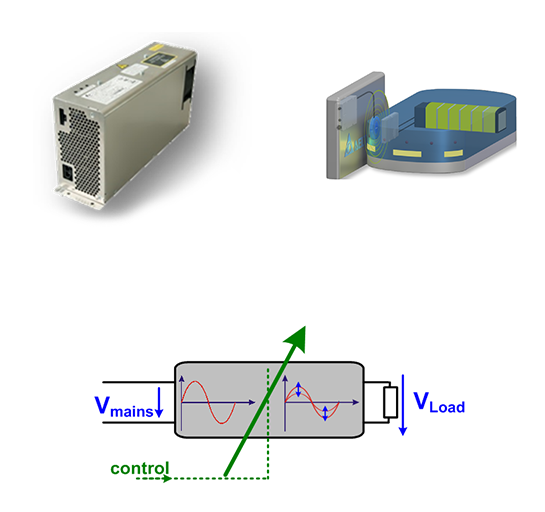 Sinewave Converter offers linear and continuous control characteristic across the complete range between 0-100%, programmable limitations of output voltage range offers the use all over the world. The Sinewave Converter has a High Efficiency up to 98% and high Power density. The Power Supply is used in applications like, Water Treatment, Wide Format & 3D printing Machines, precise Temperature regulation systems (Blood Dialysis) Motor Drives and others. As part of DET R&D team, Delta India’s R&D team has continued its expansion with increased development effort in multiple business areas and in developing new technologies. The focused development of Megawatt range power converter has now established the India R&D team as leading competence center in this area. The team has designed and developed commercially viable high power Conversion systems deployed in various applications ranging from Renewable Energies like Wind and Solar, power quality, Energy storage Bi directional converter systems. Leveraging the vast experience of 65MW of 1MW PVI installed base and Delta’s continuous strive in developing Customer centric and bankability solutions. The development High performance multi Megawatt Solar power generation business has led to the deployment of D-3000, which is 3MW, 1000V out door IP 65 rated PV inverter in year 2017. 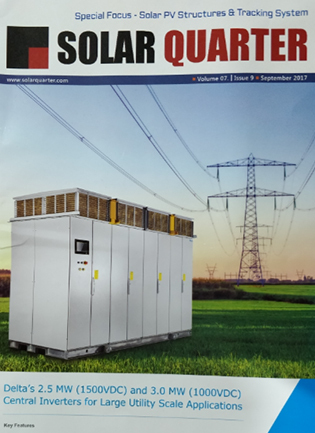 With no power de-rating till 55 degrees C, this Inverter has night time rated reactive power compensation, Passive Anti PID features, over load capability, weather station integrations etc. In 2017, The PQCE (Power quality compensating equipment) Product vertical of MWP R&D has successfully developed 6MVAR/25kV SVG/APF for the Traction substation application in collaboration with HPRT (High power Railway traction) Shanghai. This will enhance MWP R&D capability to expand and engineer the products for the Medium voltage application up to 33/35kV 30 systems without having any transformer to make highly efficient conversion process. 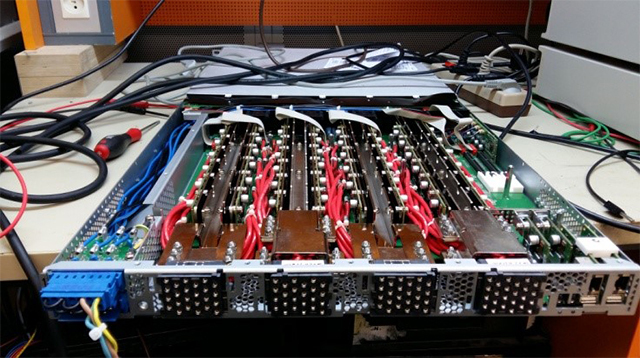 The India Megawatt R&D has developed a Bi-directional Converter for BESS (Battery Energy storage system) for grid ancillary services, energy storage applications using Delta batteries. The BESS converter is developed with integrated energy management system and can be configured to handle multiple functionalities like smoothening, peak shave/shift, and primary frequency regulation. The team is working on to extend the activities towards micro-grid products as well. The matured telecom market needs continuous innovation and cost leadership to be completive and continue to be the market leader. Multiple solutions are delivered to expanding and new 4G market. TPS R&D in India is increasing its investment in Efficient and multiple rectifier range, which caters to the global market. The New range of telecom inverter has high efficiency and compact footprint. These inverters have a range from 300 VA to 4500 VA catering to various combination of power requirement. The integration with BMS enables user to optimally utilize the available battery power with enhanced reliability. Also the solution provides integrated system level monitoring information enabling user to get all views on single UI or data portal. During last few years, the India R&D is expanded to include SW competence. This enabled the team to contribute in developing the state of art SW for our IA product platform. The new SW envisages a unified architecture and platform for entire product range. The first version of this platform, to be launched in 2018, will provide our customers an integrated environment to design, program, simulate, monitor & diagnose industrial solutions built with Delta parts. In long run, this platform will enable Delta Electronics to evolve from a components supplier to a solution provider for Industrial Automation. The platform uses industrial standards like OPC-UA, PLCOpen, IIoT, to incorporate interoperability with similar platforms developed & under development from competitors. The framework is designed such that it can integrate with other standard manufacturing process software like MES, PLM & ERP. In the coming years, the India team will enhance the product innovation in high power converters, storage and alternate power usage. The team will expand to include significant SW development. The team is investing in the new areas of high power converter application including micro-grid, PCS and related area. The Megawatt range is being now extended to traction power. In the coming year it is expected to have first on board power converter for traction in India, which includes Auxiliary (3x 130kVA) power converter and the main Propulsion converter (4.5MW) for the Indian Railway application. The increased investment in this area will help Delta to be part of expanding business of onboard railway equipment. India R&D is also planning to develop EV chargers for 48V-120 V to participate in the ambitious program of only EV by 2030. New investment is made in EV traction and SW technologies to cater to the global growth plan. Our Indian R&D team will collaborate with other Delta R&D centers in leveraging technical strengths across groups and providing competencies that add value to Delta globally. In 2017, IPS (Industrial Power Supplies) R&D teams in Thailand and Taiwan successfully delivered many new products and received great responses for them. New product series in Dinrail CliQ M introduction of 24V/40A product has received great response and has provided user a single power supply in one phase to cater their high power system solutions. Addition to this Dinrail Chrome series added model with household approval IEC60335 and has been a great success. 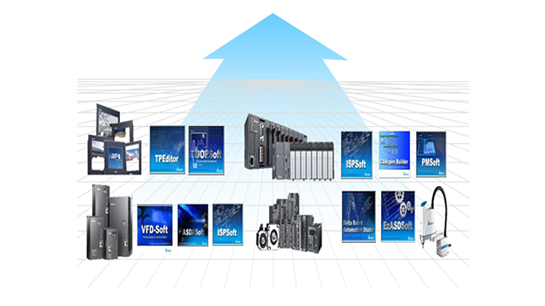 A big part of the success in IPS product is attributed to great products. With good design capabilities, IPS is able to serve a wide range of customers from the cost demanding ones to the performance centric ones. This also enables IPS to penetrate many regions in very short time. Several new standard power supplies released for LED market LNE series with addition of high power models up to 320W gives user a wide choice of models to select from. For LED market another breakthrough product released to cater to high input voltage range LNV series with working voltage from 180Vac to 528Vac connected from (L-L or L-N) suitable for both indoor and outdoor installations adds a great variety in the product basket. In Medical standard power supplies MEB-1K2A and MEU-600C with size as small as 5”x8”x1.59” gives an big added advantage on the medical products portfolio. With many more new products to be released in Dinrail series mainly for Wind Power Solutions, it will be another exciting year in 2018. The panel mount series will see new low profile household products and new open frame LED lighting products PJL series and PJH series with open frame household approvals in Y2018 with IPS team focus on wind power solutions. As Delta brand becomes more recognizable as a great standard power supply in the channels and with continuing discipline in market and product researches, IPS will continue to gain market share globally in 2018.